Easily found. You can purchase hamsters at a nearby pet store. Wear gloves when handling the hamsters to avoid getting bitten. This science fair project was done to find out if hamsters are territorial animals. The tests were done by placing several pairs of hamsters in cages and observing their behavior. Hamsters placed in the same cage will display antagonism toward each other. Animals that are territorial will defend the area that contains their nest or den, mating area, food, water and their young. They will normally mark the boundaries of their territories with scents like urine and feces, or rub objects with the part of their body that has a special scent gland. Dogs are known to mark their territory with urine, while cats are more likely to rub their feces against objects to mark their territory. When confronting an intruder, these animals will defend their territory by aggressive visual displays, audible sounds like bird calls and barking, or direct confrontation through fighting. Hamsters are rodents that are normally used as lab animals, or kept as house pets. These mammals have thick fur and a short tail. 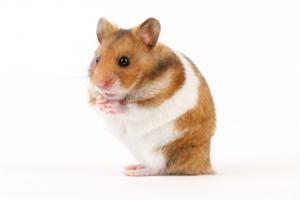 Hamsters have poor eyesight but very good senses of smell and hearing which they use to find food and avoid predators. They will normally feed on nuts, berries, fruits, vegetables and sometimes small insects like fruit flies or worms. Hamsters can live with other hamsters while they are still very young but when they grow older, they must be kept in separate cages because they are very territorial. These rodents originate from the Middle East deserts where resources like food and water are very scarce. They will therefore defend their territory to protect their resources. When two hamsters are caged together, they will normally fight to the death. 1. For this science fair project, the independent variable is placing the pair of hamsters in a cage with one set of resource or 2 set of resources. The dependent variable is the number of times the hamsters will confront each other and fight. This is determined by observing the hamsters for 8 hours. The constants (control variables) are the size of the cages, the number of hamsters in each cage and the length of time the hamsters are observed. 2. Select sixteen adult hamsters for this experiment. Divide them into 8 pairs. 3. Prepare the hamster cages by placing a water dispenser, food tray and running wheel in each of the 4 single-layer hamster cages. Place one water dispenser, food tray and running wheel on each level in each of the 4 double-layer hamster cages. 4. Release a pair of hamsters into each of the 8 cages. Observe their behavior for the next 8 hours. Observe the number of times each pair of hamsters confront each other and start a fight within the 8 hours, and record your observations in a table as shown below. 5. If the hamsters become too aggressive and start fighting violently, wear the gloves and remove one of the hamsters from the cage immediately. The results show that the pairs of hamsters in the single-layer cages with 1 set of resources fought more often than the hamsters in the double-layer cages with 2 sets of resources. The hypothesis that the hamsters placed in the same cage will fight and bite each other has been proven to be true. Providing the hamsters with a larger cage and 2 sets of resources helped to reduce the fighting between the pair of hamsters by allowing them to separate their territory within the same cage. Hamsters are normally solitary animals and prefer to live on their own. If another hamster is placed inside that same cage, they will normally fight to their deaths. Some species of hamsters like the dwarf hamster are more tolerant and can get along with others of the same species. Placing two hamsters in the same cage is considered animal cruelty and should be avoided. The science fair project may be repeated to test if other rodents, such as mice, exhibit the same territorial behavior. The experiment can also be repeated to compare the behavior of young hamsters, older hamsters and hamsters of different gender.